“The below article has been amended to reflect the work that Rayonier New Zealand has undertaken with Omataroa Kiwi Project. PF Olsen would like to apologise if any offence was caused by the original article”. New Zealander’s are typically keen, outdoor enthusiasts, with a passion for protecting their patch of bush. Over the past few years, there has been an increase in the number of groups and individuals who are involved in community conservation – taking it back to grass roots level. PF Olsen supports several of these groups as they help us to look after rare, native species, keep pest numbers down, and to meet our forest certification obligations. However, it can be hard for those of us not with our boots on the ground to understand the exact nature of community group operations, their needs, and the effectiveness of their work. Enter Trap.NZ, a free, online pest management tool created by WWF and GroundTruth. Trap.NZ allows community groups to set up projects, mapping out their project area/s and trap information (location, type, bait used etc). Once a project is set up, individuals can join a project, and submit information regarding trap catches, either via the web platform or via smart phone app. In a short space of time Trap.NZ has become home to 690 community conservation projects. 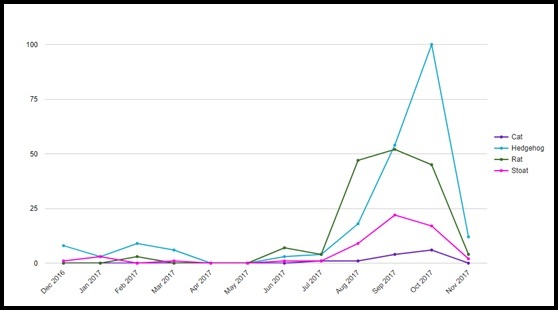 The home page provides statistics on the overall numbers of pests caught, both in the last month, and for the year to date. Once data is in the system for a project reports can be generated to show a wealth of information, with data available for download to .CSV files if the user wants to manipulate their data for their own reporting purposes. Users can also manipulate the reports to only show a specific line of traps, pest species, trap type, bait type or time period (Figure 1). Figure 1: Monthly catch totals for the Omataroa Kiwi Project, filtered to show cat, hedgehog, rat and stoat catch numbers only. A couple of months ago PF Olsen contacted Ian Tarei regarding Trap.NZ. Ian has a 15 year history of working with forestry companies Carter Holt Harvey Forests, Rayonier and PF Olsen, especially around kiwi conservation work. The Omataroa Kiwi Project, which includes plantation forest managed by both Rayonier New Zealand and PF Olsen Ltd, as well as private land, was set up in Trap.NZ (Figure 2), with tracks (roads) and traps being mapped out. Since then Ian and his workers have been using Trap.NZ to record their trap catches. They’ve found the iPhone version provides the most consistent, accurate and easiest way to collect the data, especially out in the field. Figure 2: Omataroa Kiwi Project area, showing the number of traps, and a breakdown of the key trap catch statistics for the project. 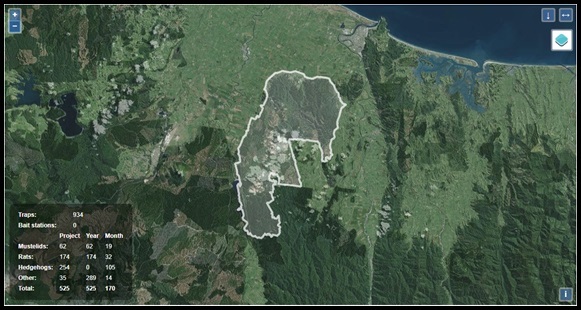 The Omataroa Kiwi Project covers plantation forests managed by both Rayonier New Zealand (6,765 ha) and PF Olsen Limited (1,446 ha), with privately owned land currently being targeted to solidify the work being done in the core area. From PF Olsen’s perspective, Trap.NZ to providing a great deal of information on Ian’s project. We now know where the traps are located, and their position in relation to hot spots (Figure 3). We can easily run reports for our forest owners, and for certification purposes, on the number of pests killed within a specific time frame. Best of all, Trap.NZ is removing the need for PF Olsen to continually follow up with Ian to get this information, leaving Ian with more time to get on with the important work of protecting his kiwi. From Rayonier / Matariki Forests perspective the project has enhanced our relationship with the landowners and it is great to see the personal development of Ian and his team of guys who are all very passionate about their work. Rob Schoonderwoerd has been involved with the project from around 2001 with CHH Forests and continues to be involved at many levels today. The project is recognised as being a unique one in New Zealand with Iwi, Regional Council, Corporate Forestry and other stake holders all around the same table working to a common goal of conservation. Rob acknowledges the work undertaken by Sarah Orton at PF Olsen in setting Ian and his team up with Trap. NZ as a recording process as previously it was all paper based and high maintenance! 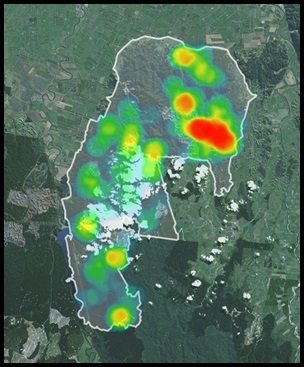 Figure 3: Heat map of rat catches for the Omataroa Kiwi Project. While there have been a few issues during the setup of the project, everyone agrees that the teething issues are worth it. Given the success of the project, PF Olsen will now look at encouraging other community conservation groups operating within PF Olsen managed forests to use Trap.NZ for their pest control records.